I'm planning on revamping an old comic strip I did a long while back as a free webcomic. The storyline is a rather silly cross-universe parody, with occasional 'rules lawyering' thrown in for comedic effect. I remember ISC Theater running not too long ago, which I quite enjoyed. And I remember that the guy who did ISC Theater had a couple of special models made for the strip (mostly texture changes as I remember). And he would use SFC battle footage occasionally in the strip. I'm planning on doing something along the same lines, as there is a fair amount of ship to ship combat in my storyline. The Rom is the standard model in the Orion Pirates RCX folder, with the 'beak' chopped off to accomodate the boom. I inverted it so that it would look more like the classic Warbird. The Klingon is the standard model as well. 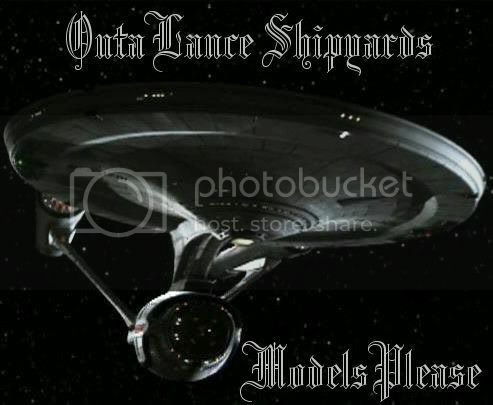 If you have a better D7 model in mind (any TMP/TNG era D7 should be fine), I wouldn't be opposed to using one (assuming permissions are in order). Would anyone like to take a crack at these? I could very much use the help! "Our saucer is fused to what?!?" Mate the Galactica launch bays turned upside down to the ship above the warp narcelles to forn an X appearance. Then mate the Rom BoP ya used above to the bottom of the Akira saucer. Alternate universe: Khan was banished for preserving the peace. The Genesis device was really a super weapon and kirk had planned to use it on the klingons. Chekov found the Botany Bay and khan hijakced and killed the evil reliant crew in an effort to destroy the genesis device. Ahh i love it The alternate universe rocks. BTW the central hanger bay tail section is from the USS Ares, with the hanger section added using Daz primitives. Someone recently made Tobias Richter's D6 and USS Ares available for Poser/Daz. Also, I'm mixing SFB and FASA lore here. She's an Alliance of Free Worlds ship. The AOFW is located in neutral space between the Federation, Klingon, and Romulan empires, a region known as the Triangle - this would replace Tholian space in SFB, and the Tholians would be locaded in some other location. I do have Poser, but I'm guessing that won't export the proper format for a SFC model in any case. Plus it's probably WAAAAAY over the poly counts typically used in SFC. While tracking down an .obj of a TMP era Federation Dreadnought might be nice, I've grown to like having the TOS nacelle at the top... and it would fit with the 'history' of this ship, i.e. a TOS era DN sitting in the scrap heap awaiting salvage, only to be rescued by enterprising AOFW fleet personnel through an auction/negotiation with Starfleet. Of course, Franz Joseph DNs aren't part of FASA lore, but cross dimensional stuff ties in with the story, so it'd be an alternate timeline thing. Note that the models I used for this kitbash are 'personal use only' which means I can't use them commercially or redistribute them. I suppose I could ask the various modelers for permission, but I suspect that not many people would be interested in this ship in the first place. It's mainly for a story anyways. If I ever decide to resurrect the very primitive comic strip I did briefly that featured this ship several decades ago, I might use her in a visual novel or something, but it'd have to be 'free', unless I could secure commercial usage rights for the donor models, if I were to do the Patreon artist thing. Ahh well, I like how she's turning out anyways, although I have a number of other tweaks that I still want to do. Just had to share. As for the other ship I featured in my OP, well it's on my to do list the next time I feel like doing another starship Kitbash in Daz.